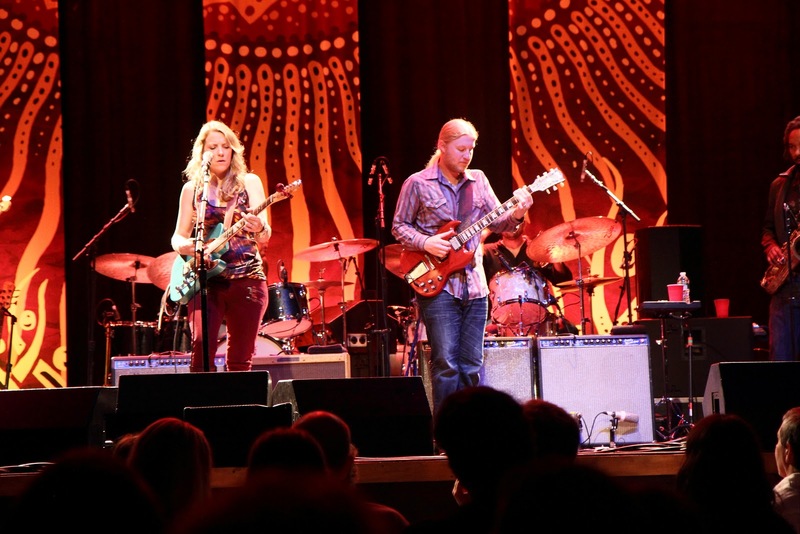 Once more, we bring you a report from Tedeschi Trucks Band's European Tour, courtesy of Stuart Raper, a man of exquisite style and taste. This time, Stuart brings us to Stuttgart and Paris as TTB winds their way around Europe. Join us tomorrow for the story from North Sea Jazz Festival and a night in Bonn with Gregg Allman. In Stuttgart, TTB played the Mercedes-Benz museum and much like the automobiles, the band was firing on all cylinders. They dusted off the Delaney & Bonnie classic "Comin' Home" for the first time of tour where Kebbi took a mean sax solo. Susan also stepped up to deliver some prominnet lead guitar on this track and it was smokin'. "Anyday" came out running hot, then the band brought the groove way down, and made way for Kofi to take an amazing flute solo. First time he'd pulled out his flute on that tune thus far into the tour. He and Derek proceeded to build the jam back up, with DT throwing in teases of "Blue Sky" into another great jam. As always they closed this one out strong. Kofi also took his first "Midnight In Harlem" flute solo of the tour here in Stuttgart which added a lovely garnish to the song's beauty. Each of the horn players have naturally found songs to solo on giving them their deserved piece of the spotlight. "Comin' Home" is definitely now one of Kebbi's, while Sly's "Sing A Simple Song" often features Maurice blowing away. Tonight, Saunders stepped up to shine with a great trombone intro to "Space Captain" then took another great solo, swapping licks with Derek. I look forward to seeing this happen again soon. It was a great way to close out the show, much to the pleasure of the band and audience. Next stop: Paris! One of the loveliest and most culturally rich places on earth, Paris lived up to its legends and beyond. We pulled into town a day early and all went seeking our own adventures. I had the privilege of accompanying Maurice Brown and Kebbi Williams on a mission to find the most happening jazz club in Paris, for them to enrich the local soundscape with their extraordinary musical gifts. Maurice has performed here before and remembered a particularly unique spot, after wondering around for a few, his memory kicked in and I found myself following him and Kebbi down a dim stone staircase into a basement cavern, carved out of stone, with a rocking jam session going on. Le Caveau de Ouibliettes was its name, and once our boys got up on stage, nobody wanted to let them leave. They played on everything from jazz to soul, R&B, and straight up James Brown funk. Maurice and Kebbi took us all to school, for sure. It was the perfect way to start off our Paris trip. The next night TTB took the stage at Le Trianon, an ornate theatre, built from a converted firehouse. It had good sound and a captive audience who never hesitated to clap along to the band's groove. Everyone in the group was on fire as they roared through the staples of this tour's setlist. Derek and Susan were speaking to each other with their guitar riffs, with amazing interplay back and forth. Oteil was somewhere between Jaco and James Jamerson, completely in the zone, looking up only to beam at his big brother and the rest of their bandmates. I've seen Oteil play many shows with a wide variety of groups, but never have I seen him as happy as he is onstage with TTB. His enthusiasm is felt by all, each adding their own personality to the group's collective energy. "Anyday" surely was the standout song on this night. Kofi has been rotating his solos between keys (with some dominant clavinet) and flute for his solo on this song. In Paris, he channeled the lead guitar onslaught of the Clapton original, on flute, prompting Derek to take monstrous solos to follow him. Right as it seems like it couldn't go any higher, DT signals to the band and brings the groove down to the floor. Here the song takes on a gentler and jazzier vibe, it builds gradually then evolves into the "blue sky" jam. Another sign of the genre-bending dexterity of this ensemble, it crescendos with wailing guitars and a powerful finish to the chorus sung by Mike and Susan. Just one example of many in a fabulous evening of music. The encore was "Space Captain," a rocking soulful number that got everybody clapping and perfectly paved the way for their original, "Bound For Glory," a title that seems to suit this band more and more as they continue to progress. After the show, we were lucky enough to find a delightful restaurant that was kind enough to serve a delicious late night duck supper to some hungry and hardworking musicians. In return, a few of the band members thanked them with a song on their house piano and guitar. A wonderful end to our stay in one of the world's most exquisite cities. Next up TTB plays North Sea Jazz right before Prince and I have no doubt that they'll rise to the occasion as always.